If there is no link above, I am still too new and EVGA won't let me. Seeing if anyone out there has pushed bast the 15k mark with any consistency without dry ice, LN2, or anything else crazy. My current setup is a 9900k, running at 5.2, memory is 3600C15 currently clocked at 4000C17, and 2 FTW3s with hydro copper. PSU is the 1600T2, all watercooled. Oh, I have 1x 420 rad and 1x 360 rad. To help anyone with my travels so far. With everything stock my graphics score was in the 13000s, playing with PX1 I was able to get +150ish and +1000ish (don't remember exactly) and that got me into the low-mid 14000s. I am hoping some sub timing adjustments will get me solid in the 15000s. So far the most extreme cooling attempts I've done were to aim my AC vent at the computer, there is nothing crazy, right now, sitting in a 75 degree room (I live in FL) I can hit high 14000s all day with the computer being barely audible. But I really think this proves that running X16 on both cards also makes a big difference with RTX Cards. for reference, i think i have somewhere around top 10 score in firestrike extreme and ive literally only ran that benchmark twice. Just to show the wide bias between the 2 benchmarks as it relates to cpu. Anything graphics related i refer to firestrike ultra as king. Thats the best representation of graphics and likely gaming performance relatively. I also have the ftw3 hydrocopper sli but since i have a big case im running more rads. i have 2 separate loops but the gpus get a 420 and 120. 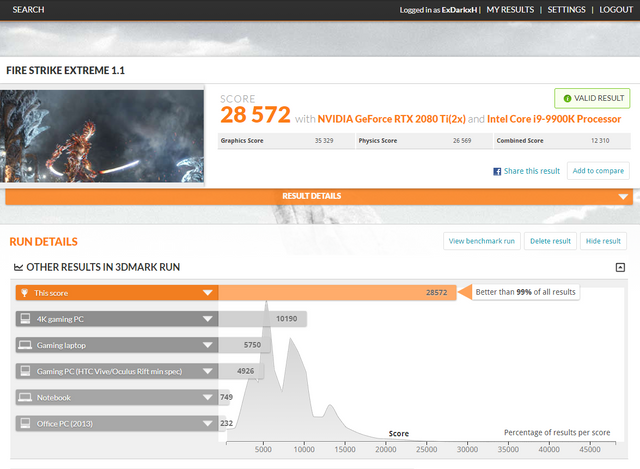 3dmark is fun, but game benchmarks are better for judging real world performance. Shadow of the tomb raider is a good one to use. Your GPU/Memory clocks are really high! Did you win the lottery twice, or are you running with a chiller or something to cool it off? I did use better cooling for this run but it wasnt too crazy.. it was sub ambient by about 12c but def way above freezing. how did you get that galax bios? You are running about the same as me, I meant your graphics memory/clocks are way higher than mine. Though if you were running sub ambient to your 2080s, that would help. Didn't think the Galax bios was a big power limit jump. Worth it? For you it most likely isn't worth it, and the vbios might not work correctly on your card since it's made for reference cards. I'll try again later with the house cooler. I do not understand people using Z390 systems with SLI...the 9900K does not have enough PCIe lanes to fully feed both cards. It's such a waste. I go by Overall Score, not one part of it. Though there may be a couple percent slowdown, the NVLink bridge is doing most of the heavy lifting. Gamer's Nexus did a test of it, and as long as you were using the nvlink, 16x/16x and 8x/8x were within the margin of error. In many games, the 9900k with a pair of 2080tis will outperform the 9980xe with a pair of 2080tis due to the higher single threaded clock speeds. 9980 is only faster if the application is doing a lot of multithreading. Sajin, what up with the Galax bios and is it for the video card or motherboard? It's for the video cards. It will increase the power limit of reference cards to 380w. You can use nvflash to flash the vbios to your card. how is the number 1 overall score using a 9900k with sli 2080tis? if its such a limiting factor why not swap cpus?